​Please read this entire post. You MUST check-in with the CALSOUTH Referee Coordinator no later than 1 hour before your first game; not 30 minutes, not 45 minutes, this is State Cup. The coordinator will inform you about the State Cup rules. NOCRA State Cup Rule Review: https://goo.gl/forms/uppyVScJmbM4WdnN2 It will prepare you for your matches. GAMES CAN BE CANCELED OR RESCHEDULED. IT IS THE REFEREE’S RESPONSIBILITY TO CHECK THE OFFICIAL CALSOUTH SCHEDULE (NOT ARBITER) BEFORE HEADING OUT TO THE GAME. ​Referees at all venues MUST BRING a copy of this form and present it to the coordinator(s) at the time they check-in. Downloaded copies on phone not accepted. Review these rules with both coaches prior to each match. – Jerseys (NEW STYLE) yellow and green is a must; and you must have a 3rd color (red or blue); short and long sleeve. – Referee Jersey must be different than the teams and both Goalkeepers. – Two-striped socks and BLACK footwear. CALSOUTH IS CHANGING TO 2-STRIPE. REFEREES CREWS ARE TO MATCH. • Concussion Procedure - you MUST KNOW this!!! • Black hats (USSF or no logo) are permitted if the CalSouth Referee Coordinator says it is ok. If you elect to carpool work out the money on game day. When you arrive at the parking lot there will be attendants collecting parking fees. Always a good idea to let them know you are a referee. Should you have a game day forfeit go to the CalSouth Referee Coordinator and complete a Referee Forfeit Invoice. Recommend you take a pic. CalSouth will reimburse you by mail. When you ARRIVE check the fields, goals, anchors and nets. Any problems notify the field marshal or the CalSouth Referee Coordinator. * Make sure the substitution procedure is conducted correctly. All the way of the field, subs to enter at halfway line. READ THE STATE CUP OR NATIONAL CUP RULES THEY ARE DIFFERENT. * Olders talk about offside participation; fouls, especially persistent, simulation and misconduct. Say hi, good morning, smile. 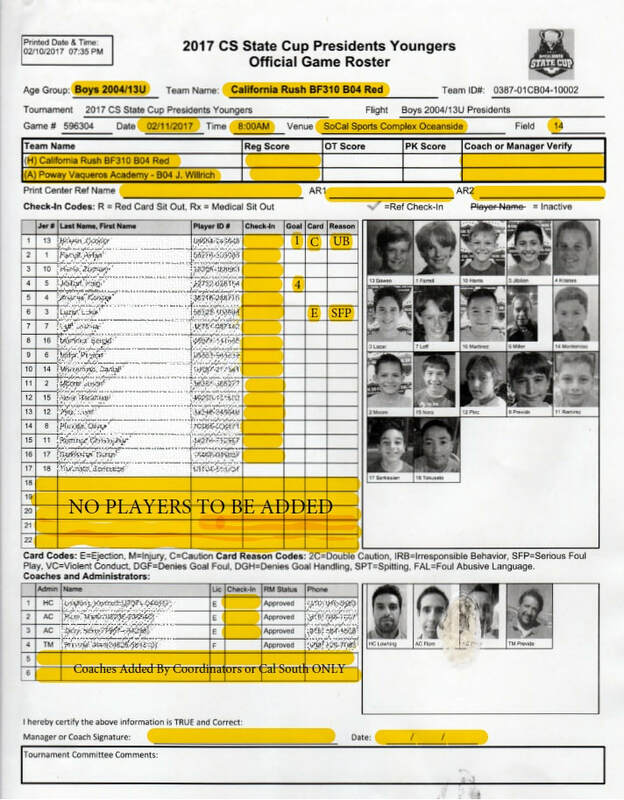 Collect Game Roster form (See bottom of this page for sample) and coach & player ID Cards. I go over safety, mutual respect, set the right example for the players and specific tournament rules and substitution procedure. Check-in: follow the procedure that the Referee Coordinator tells you. Be professional, have fun, drink water, enjoy the games. And most importantly manage your sidelines politely and respectfully. Remember our meeting discussions "Please Coach _______ Please" and "Thank You." 1). Game #, date, time and field # should be the same on both rosters. 2). Team Names should be the same on both rosters. 3). Manager and coach should sign and date bottom or roster prior to game. 4), Use check-in boxes. All players and coaches should either have a check mark or be crossed out. 5). No players or coaches to be added on roster. Contact Referee Coordinator. 8). PRINT Referee and AR's first and last names. 9). TURN IN COMPLETED ROSTERS TO REFEREE COORDINATORS...NOT TO THE TEAMS!